Who would have guessed, that since opening the shop for business a few months ago, I would quite suddenly find myself in the awkward situation of being able to sell my work faster than I can create it. The two tabourets have sold, the child’s puzzle rocker sold, and the two Rhoorkee chairs have sold (more on that later). Oh, and all the mice sold too. So now, I am embarrassingly short of inventory, except for the privacy screen and Kris’ rocker which is a demonstrator, not for sale. Yet, this doesn’t seem to dissuade my customers. Given the rate at which items had left the shop, I therefore resolved to make multiples of everything until my inventory was back to a comfortable level. Thus, I have made four new puzzle rockers. They are waiting for some new child safe finishes to arrive, but today I sold one anyway. I hope that I get to finish the remaining three before they sell. Congrats on a great blast off! Good to see you're getting customers, and given word of mouth, you'll likely have people lined up on the sidewalk soon. that is a great problem to have! Baltic birch ply for the puzzle chairs? I too like the puzzle chairs and build for friends etc. 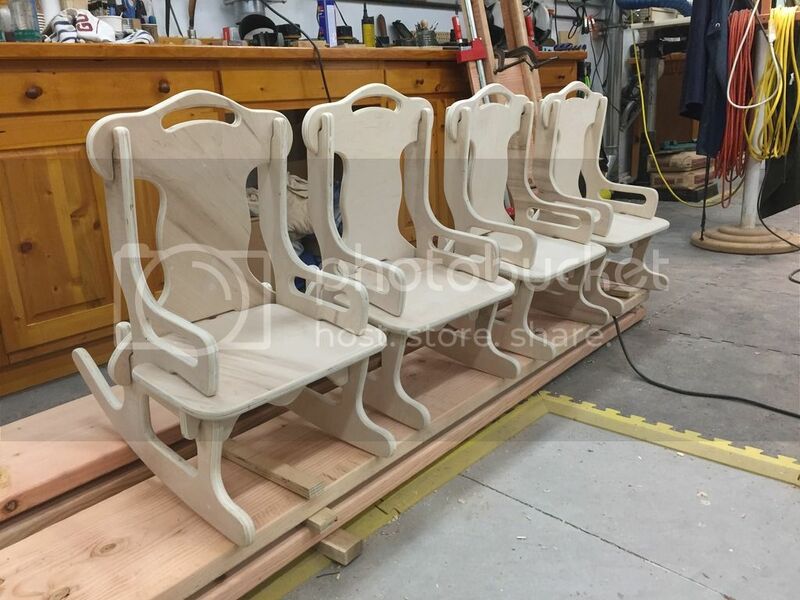 In the past, I've used baltic birch, and I can get three chairs out of one sheet. This is maple ply and is 4x8' so I got four. However, the quality is no way near as good as the baltic birch ply. This stuff required a lot of edge sanding and filling of numerous voids. I'm not sure whether or not I would use it again. Last edited by tms on Tue Feb 16, 2016 9:59 pm, edited 1 time in total. Looks like you have a problem that most busness wish they had. Some of the places around here sell baltic birch (some times labled apple ply) in 4 x 8 sheets. It is virtually void free. Tom does not cabinet grade birch ply have little to no voids?? It does have thick laminations though doesn't it, don't know if that is good or bad for making the rockers. Is this your own design? No, this is a design posted by our own Dewayne. He gave it up freely on the condition that we make one for a child in need. I made a couple for the playroom at the local Children's Hospital. Wow very nice and did you cut with a CNC Router? How can I get a set of plans?